If you follow the news, it’s hard to avoid the constant claims that President Trump has made, taking credit for a strong economy. This claim raises a bunch of questions, but a tl;dr assessment of the Trump economy in 2018 is pretty simple: It’s good, but not great. The Trump administration deserves zero credit for its pockets of strength. And everything they’ve done on economic policy indicates that they will be terrible macroeconomic managers, and will bungle any challenge that comes their way in the next few years. The longer version of this is below. By almost any measure, the economy today is stronger than it has been in a decade. But that’s a really low bar! This decade began with the worst economic crisis since the Great Depression, and the economy’s growth has been severely hamstrung ever since. After eight-and-a-half years of steady recovery, the unemployment rate today sits at 4.1 percent, lower even than its pre-Great Recession level. This is unambiguously good news. But other measures of health in the job market tell a bit less-rosy story. For example, the share of “prime-age” adults (between the ages of 25 and 54) with a job remains below its pre-Great Recession peak even after years of improvement. We would need to add millions more jobs to push it back to levels it reached in the not-so-distant past of the early 2000s. 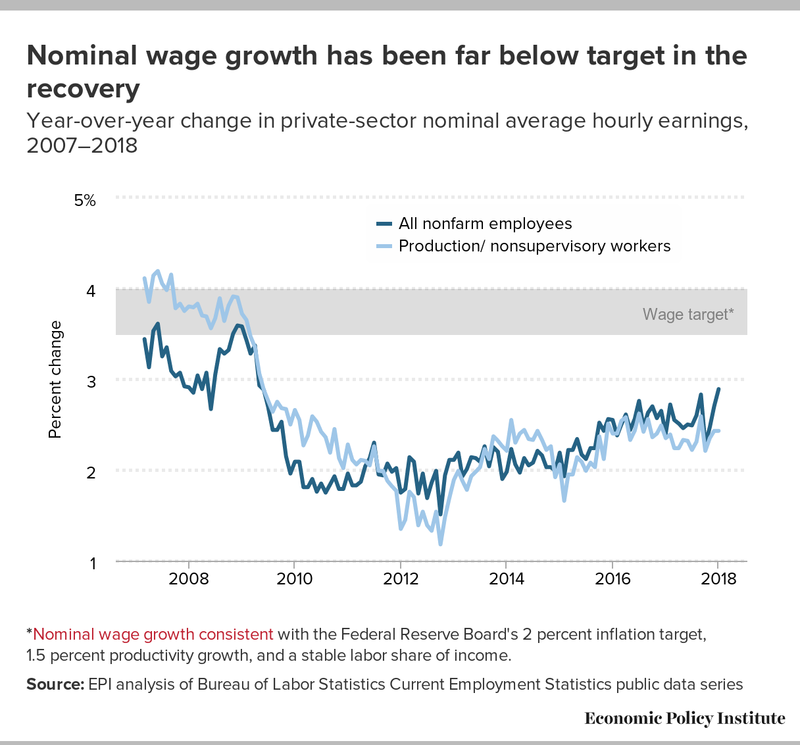 Wage growth also remains distressingly weak, and this wage weakness has blunted the incentive for employers to make productivity-enhancing investments. After all, there’s not much point in spending money to economize on labor costs when workers are cheap and easy to find. If we manage to keep unemployment at its current level (or below) for another year or more, my guess is that we’ll see the flywheel start to engage for wage growth. But this might be wrong—we may need to target even lower unemployment rates. Further, it’s an open question (more on this below) how long we’ll be able to maintain even today’s low unemployment rate. But what about the stock market, that’s going gangbusters, right? It was, but that run up was irrelevant to the living standards of the vast majority of Americans. The wealthiest 10 percent of households own 85 percent of stock (with almost half of this held by just the top 1 percent). Meanwhile, just under half of Americans hold no stock at all, even indirectly through retirement accounts (see Box 6 in this report). Further, stock price increases mostly just transfer wealth from tomorrow’s aspiring wealth builders (who will have to pay steep prices to invest in the stock markets) to today’s wealth holders. And the past couple of days of large declines ought to make anybody (even Donald Trump) leery about claiming credit for stock market movements for a while. In summary, the economy is stronger than it has been in a long time, and that’s good. But popping champagne corks about the economic lot of typical American workers seems awfully premature. How much credit does the Trump administration deserve for the economy’s good news? None. 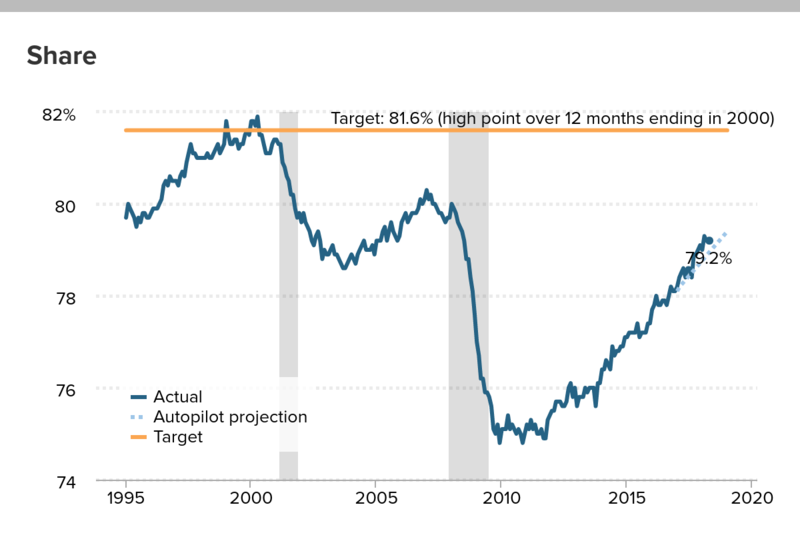 This administration inherited a steadily improving economy, one that had posted 75 months of consecutive private-sector job growth. The past year has seen the recovery continue almost exactly on pre-Trump trends. An analogy would be the Trump administration as a doctor who inherited a patient from a retiring partner in his medical practice. The patient is young, eats a healthy diet and exercises regularly. Does Dr. Trump deserve credit if this patient makes it through a year without a medical calamity? Of course not. Someday, of course, almost all of us will need a doctor to help us navigate a health crisis, and we sure hope that doctor doesn’t turn out to be a quack. So will we be able to rely on the Trump administration’s judgement when the economic going gets tough? To answer this, we need to know the most likely crises the U.S. economy will need to navigate in coming years. This is pretty straightforward, as recessions largely come for three reasons: first, the Federal Reserve makes a mistake and raises interest rates too far and too fast in an effort to get out in front of inflation; second, bubbles form in financial markets and then they pop; third, fiscal policymakers engage in excessive austerity. Has the Trump administration shown much wisdom so far about avoiding these pitfalls? Nope. The administration has made two appointments to the Fed’s Board of Governors, and refused to re-appoint Janet Yellen as its Chair. The two new appointments—Randal Quarles and Marvin Goodfriend—have both been consistently wrong about the need to raise interest rates to avoid inflation in recent years. If the Fed had followed their advice, unemployment would be considerably higher today. Janet Yellen, conversely, consistently prioritized allowing unemployment to drift lower over any need to fight forecasted (as opposed to actual) inflation. In essence, the Yellen approach was “we’ll fight inflation when it actually appears and not before.” Given the benefits of lowering unemployment—particularly for the most vulnerable workers and communities—this approach paid huge dividends in recent years and is largely why unemployment sits at 4.1 percent today (#ThanksYellen). Trump’s picks have clearly shifted the balance of the Fed towards people who have been both wrong and more callous about the impact of the Fed’s actions on the economy and working people. The possibility of a Fed mistake leading to a recession is much higher now because of these picks. The Fed is the nation’s chief financial regulator, and these same appointments mean that it will likely loosen the reins on Wall Street regulations. In one of her last speeches, Janet Yellen made a full-throated call to maintain the enhanced regulatory safeguards put into place after the 2008 financial crisis. This speech could well have contributed to her replacement—the Trump administration seems determined to let Wall Street run riot again and a commitment to smart regulation doesn’t really fit with this program. Besides the new finance-friendly picks at the Fed, the Trump administration also installed Mick Mulvaney as the new head of the Consumer Financial Protection Bureau (CFPB). Mulvaney was one of the largest recipients of contributions from payday lenders as a congressman, and as CFPB head he has already rolled back key regulations protecting borrowers from predatory lenders. He also issued a memo to CFPB staff informing them that they in fact “serve” payday lenders. Republicans in Congress have pushed the Financial CHOICE Act, which would strip away many of the key safeguards and protections of the Dodd-Frank Act that was passed in the wake of the financial crisis to rein in financial sector excesses. All in all, the Trump administration seems determined to let Wall Street go back to self-policing rather than engage in meaningful oversight. This is particularly worrisome given that several financial markets today, while not obvious bubbles, do look frothy. Further, the worrisome dynamic where big asset market gains lead to low savings rates and make further economic growth contingent on continued asset market inflation may have already started. 2017, in short, was a terrible time to switch to an administration that is much more lax as a financial regulator. Finally, fiscal austerity has been holding back the U.S. recovery for several years. In the short-run, the recently passed Tax Cuts and Jobs Act (TCJA) will actually provide some mild relief from this austerity. As poorly designed and unfair as the TCJA was, anything that spread some money into the U.S. economy would have provided a mild fiscal boost. But the other side of the Republican fiscal agenda has been calls for mammoth cuts to federal spending. If these actually came to pass, this would all but guarantee a return to recession. President Trump was handed an economy with lots of positive momentum. His administration has spent much of the first year claiming he deserved credit for these inherited trends while simultaneously chipping away at working people’s ability to benefit from this improving economy. He has also given us every reason to believe that he’s the wrong man for the job of leading the economy through future challenges. We deserve better leadership than this.